On Eagle's Wings is an inter-denominational Christian ministry that proclaims Jesus Christ and serves the Church and individuals in remote and isolated areas of northern Canada. On Eagle’s Wings is all about what God can do, is doing, and is yet to do, when we open ourselves to God’s gracious providing and guidance. 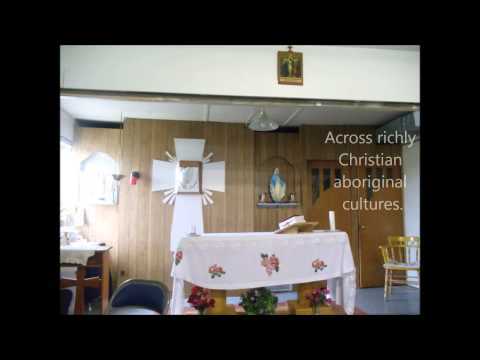 On Eagle’s Wings is a compassionate and empowering ministry among aboriginal people, fully respecting their culture, traditions, denominations and histories even as they acknowledge and accept mine. On Eagle’s Wings is an ecumenical ministry, and I believe that Christians are stronger together than apart. On Eagle’s Wings invites Christians to serve together and do collaborative ministry; by doing this On Eagle’s Wings models effective ministry in the post-denominational era this is beginning. On Eagle’s Wings brings people together and eliminate human-devised barriers between people—north and south, aboriginal and non-aboriginal, Canadians and U.S. Citizens, and denominationalism. On Eagle’s Wings invites people to serve based on their strength, the strengths of their culture denomination, and personal abilities. On Eagle’s Wings’ core values of Respect, Integrity, Ecumenism, and Stewardship are actually integrated into all we do, not just given lip service. On Eagle’s Wings is honest with donors and supporters. Being a Summer Bible School volunteer with On Eagle’s Wings enables me to experience the sheer grace of God when aboriginal parents entrust their children and their children’s faith formation to a team of non-aboriginal Christians, who easily might be assumed to represent the religious and other institutions that betrayed the trust of previous aboriginal generations. On Eagle’s Wings makes it possible for Roman Catholic, Baptist, Lutheran, Anglican, Salvation Army and many other Christians to make a common witness to the Lord of Life, Jesus Christ. On Eagle’s Wings is a voluntary association of Christians committed to a specialized Northern ministry, and this ministry happens because the people of God choose to support it, not because a judicatory office mandates and finances it. "We don’t have a regular Sunday School any more, so one thing I notice about our Bible Camp is that it brings the kids closer to believing in Jesus. The kids are anxious to learn. " — Dorothy, Community Leader, Garden River, AB. "It’s all making little patches of God’s family so welcome and encouraged, and loved, that it brings such joy to the families." "Thanks for letting me have fun. Your wroth getting up to. Your like my sun when I wake up. You’re my angel when I die. Your wings spred and seround me and pretect me. (Spelling as the children wrote it)"
"I love how children respond to hearing about Jesus and how much he loves them. There is no geographic or economic limit to God’s love…children respond with wonder and joy when they hear God loves them. " — WIN! curriculum developer, Miriam (Mim) Campbell. "Changed forever! Can’t say enough about the blessings, the honour, and even the challenges of being present in Ulukhaktok! " "The missionary spirit of On Eagle’s Wings is the fuel that helps many lamps to burn a bit more brightly in the dark night of our northern society…… We are proud to have them working in the same mission field. May that association flourish for years to come to the greatest glory of God. " "I hear and see God’s people catching a vision for new ministry in a different way, such as On Eagle’s Wings. And I see the Lord bringing things to fruition. Then hope is reborn in me. (Hope Reborn, Canadian Lutheran July /August 2008)"
"Please keep up your great work spreading the word of God and teaching people to take an active role in their faith and their communities. "